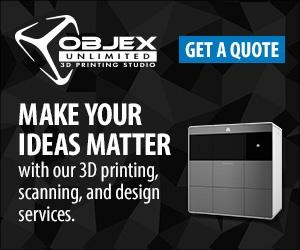 3D Systems (NYSE:DDD) announced today that its recently unveiled Cube® 3 and CubeProTM 3D printers will commence commercial shipments in the second half of June 2014 and are now available for pre-order on Cubify.com and through Objex Unlimited. Previewed at the 2014 Consumer Electronics Show, the Cube 3 and CubePro take consumer 3D printing and desktop engineering experience to a new level, with multi-color and multi-materials, the highest resolution available at 70 micron layers, faster print speeds and printing on the go, directly from a smartphone with the new Cubify mobile app, to be released when the printers ship. Both the Cube 3 and CubePro are designed to fit any lifestyle or workplace with 3D printing made easy and pro. Whether you are an engineer or a fashionista, a kid or a hobbyist, the Cube series can fulfill your complete range of 3D printing needs with expanding materials and design tools that are complemented by 3DS’ Cubify.com, the ultimate destination for users to co-create with brands, stylize printable content added daily and share what they’re making in the Design Feed. Cube 3 is the only dual material, plug-and-play, kid-safe certified 3D printer that is also the easiest and most affordable to own at $999. Cube comes with two starter cartridges in neon green and white, and 25 designs to get printing quickly. Print Fast, Print More – Cube 3 delivers up to 2X faster print speed and accuracy than competitors for printed parts up to 6” cubed. 70 micron-layer thinness gives prints smoothness and fine detail for textures at the highest resolution available in consumer 3D printing today. Full tech specs are available here. Simultaneous Dual Color + Multi-Material = More Choice – Cube now prints in two materials and up to two colors, simultaneously using compostable PLA and recyclable ABS plastics. Both materials are available in 23 different color cartridges. Cube offers a choice of print mode fill density: hollow, strong and almost solid in both PLA and ABS plastics with optional, easy breakaway supports for the most complex prints. Instant Load Cartridge – Instant material loading is now easier than changing an ink cartridge. The new non-clog technology and moisture-lock cartridges ensure extended shelf life and total material usage, improving print quality and sustainability. The printer detects material type automatically based on the cartridge, eliminating the need to change print settings. The cartridges are easy to load and store while preserving the life and quality of the materials. Kid-Safe for Everyone – Cube meets all IEC 60950 Printer Safety Requirements, making it the only consumer 3D printer that is kid-safe for the home and classroom. Convenience in the Palm of Your Hand – Enjoy the freedom of mobile printing directly from the Cubify app for iOS and Android. Find new things to print in the curated brand collections or browse the Design Feed for inspiration to add to your Shelf. Prep and print from your smartphone direct to Cube. Easier to Use, Sleeker Design – Building on its iconic design, the new Cube features a color touchscreen with an intuitive user interface and sleek LEDs highlighting prints in action, and is equipped with faster Wi-Fi and Bluetooth connectivity, an auto-leveling printpad and easy support removal on complex prints. Sustainable Systems – 3DS is committed to making consumer 3D printing affordable, safe and sustainable. Send back empty cartridges to designated 3DS locations for reuse in exchange for a discount on new cartridges and return used ABS and PLA prints for responsible recycling or composting by 3DS. All Cubes will be shipped from local distribution centers reducing freight. Cube comes with a proprietary print pad that conserves power compared to other 3D printers. The professionally capable CubePro is the only triple material, controlled print chamber, engineer’s desktop 3D printer, that starts at $2,799 making it an affordable tool for the garage entrepreneur at home, independent designer and engineer’s desktop. Print Big, Print Fast – Print more and faster with the largest-in-class print platform, high-resolution prints and quick set up. With prints 2.5 times larger than any other desktop prosumer and hobbyist printer (10.8” x 10.45” x 9.5” or 275 mm x 265 mm x 240 mm), and guaranteed faster, more precise prints with easy feed cartridges for prolonged material life. Print Precise, Print Professional – Ultra high-resolution settings of 70-micron thin print layers, professional quality printing has never been so easy and fast. Choose automated slicing settings for quick draft prints or utilize Advanced Mode to set custom infill patterns, inner and outer surface layer sizing and outer wall thinness. Full technical specifications are available here. Controlled Print Chamber – Controlled process environment ensures true to CAD prints and delivers professional quality every time. Automated settings deliver safe home printing in your mancave, on your workbench and at your desktop. Triple Color + Materials = Thousands of Options – Available in three print head configurations, CubePro allows users to get more expressive with 3D printing in up to three simultaneous colors and more color options. In addition to ABS and PLA plastic, CubePro also supports a new engineering grade nylon material, perfect for end-use applications, making it a very versatile engineering and hobbyist printer. Connect Better– Connect intuitively through an easy-to-use color touchscreen display and WiFi capability. Sustainable Systems – 3DS is committed to making prosumer 3D printing affordable, safe and sustainable. Send back empty cartridges to designated 3DS locations for reuse in exchange for a discount on new cartridges and return used ABS, Nylon and PLA prints for responsible recycling or composting by 3DS. CubePros will be shipped from local distribution centers reducing freight. The new CubePro comes with a proprietary print pad that conserves power compared to other 3D printers. Which room in your home will your Cube live in? Learn more about 3D printing made easy for your lifestyle here. Watch a video of the new Cube 3 and CubePro. The Chinese government has found an amazing new application of 3D printing and scanning technologies: preserving as well as replicating the famous Qianshou Guanyin sculpture, which is carved into Mount Boading in the Dazu District of China. The 3D printing of historical artifacts seems to be a growing trend, reminding us the power and flexibility of eternalizing any object with a scan, a design file, and a 3D model. “Engineers have 3D scanned the 12.5 X 7.7 meter statue, which was carved into a cliff during the reign of the Southern Song Dynasty from 1127–1279. From the 3D scans they have printed out a replica of the famous sculpture, which is about 33% the size of the real thing. This has been a great way to preserve the sculpture digitally, so that generation after generation can appreciate the work, even as the original continues to corrode. This is the first of many restoration projects that the Chinese government has planned on using this technology for. This is a great example of how 3D printing and scanning can be applied in new innovative ways. With the knowledge that nothing lasts forever in the physical world, combined with the fact that a picture can only show so much, it becomes clear just how powerful 3D printing and scanning technology can be as means of preservation. A 3D model, whether in CAD design or 3D printed, gives a much deeper story, and doesn’t degrade over time.